Pense Donc! 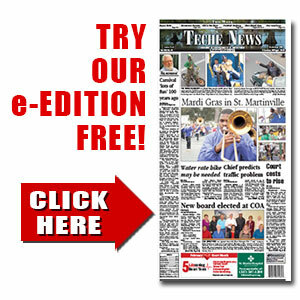 | TecheToday.com | Teche News | St. Martinville, La. Lots of St. Martin Parish families – along with thousands more across a huge swath of south Louisiana – face a long and painful road to recovery from last week’s historic and devastating flood. More than a week after the deluge which dumped more than two feet of rain on some areas over a 24-hour period, many homes are still inundated by standing water and even more remain unreachable by regular vehicles due to flooding of roadways and yards. Those families face the daunting challenge of trying to salvage as much as possible of their belongings and the heartbreaking decision of whether to rebuild or relocate. I’m sure there will be those who voice criticism of governing authorities for not being able to prevent, or at least minimize, this tragedy. But I think any reasonable person would have to concede that no drainage system could realistically be expected to handle so much rainfall over such a short period. There are just so many areas here in south Louisiana where homes and subdivisions should probably never have been located so that no structures would ever have to contend with high water. Our landscape is so relatively flat that mere inches often spell the difference between a flooded home and a dry one. Those few home owners who spent extra money hauling dirt to raise their home’s plot have seen their investment pay big returns. But the many more who just poured a slab on an existing site are suffering. Hardly anyone here in St. Martin Parish has not been somehow affected by the flood. So many of our family, friends and neighbors are facing hard times indeed. But hopefully the stubborn and always optimistic Cajun spirit will help to carry these folks through to better days. Ironically, Lower St. Martin, which over the years has had to cope with a number of flood issues, escaped unscathed from this latest tragedy. And I understand that the good residents of Stephensville and Belle River got together and sent a big load of supplies to their fellow citizens of Upper St. Martin in gratitude for the assistance they’ve received in the past. Speaking of good neighbors, we could fill pages with stories of the generosity and kindness of friends, relatives and even complete strangers who rushed to provide helping hands, food, clothing, transportation, housing and other aid for families as well as pets and livestock. Close to home – On a personal note, our family’s closest brush with the flood came at the home of daughter Therese Bennett and her family at the end of Academy Drive on the western edge of St. Martinville. Their lovely home on a 2½-acre tract included a swimming pool, classroom building for their six home-schooled youngsters, a large garden plot, almost 100 laying hens, a half dozen goats and several cages of rabbits. They had to evacuate and the house is flooded with almost a foot of water while most of the property is under several feet of stagnating water that probably will take another couple of weeks to completely recede. They’ve lost furniture and appliances, classroom computers, and lawn and garden equipment. We were able to clean out their well stocked freezers ahead of the flood and they’ve found temporary housing here in Pinaudville. But it’ll be a long road back to any semblance of normalcy. And that’s just one of many similar stories from around the parish, not to mention the devastated areas of Livingston, East Baton Rouge, Ascension, Acadia and Jeff Davis parishes. A tragedy of immense proportions. Stunning Performance – On a brighter note, those who attended the musical presentation by Henderson native André Courville at the Maison Duchamp Saturday were treated to a stunning performance. The talented young man has a powerful voice that has earned him international acclaim and it was a real thrill to hear him so up close and personal. Aug. 17 – The 51st anniversary for L.J. and Pat (Duplantis) D’Albor of St. Martinville; the 48th for Lenny and Rita (Rodriguez) of Catahoula; and the ?? Nick and Pris Dupre of Breaux Bridge. Aug. 23 – The 41st for Russell and Norma Reed of St. Martinville.